Dottie - Best Christmas Gift Ever! November 19, 2012 - a Monday. My wife said 'we have to take a ride to the Bronx'. Why? I asked. She said 'we need to pick up a gift'. Well, we live in New Jersey, and traffic is crazy at rush hour ... hmmm! Why is it called rush hour when it moves soooo slow going over the Washington Bridge? But I did as I was told. We walked up a flight of stairs at a home. The lady said follow me - OK, something heavy to pick up and load in the SUV. Well! Complete shock ... three, yes three, Siamese kittens. Two had already gone to new homes. They came in at eight weeks and no more than eight oz wet. I picked up one male (a cutie). Then the female ... love at first sight! Her name is Dottie, after my mom, who stole my last Siamese 30 years ago. She was a blue seal called Athena and lived to be 22 years young. Well, Dottie is a character as most kittens are. She will start climbing up my back leg and make it all the way to my shoulders, she thinks she a parrot, no doubt! She has six dogs and five cats as brothers and sisters; all were rescues to complete that big family and she gets along with all of them, although Diesel the chihuahua is her best friend. They wrestle like crazy, make the WWE tame in comparison! She is looking very much like a lilac, love the color. Light gray points, I am sure they will get darker, but perhaps not. I don't need to buy toys, cause everything is a toy for her, but I do anyway. The laser pointer is the most fun to play with. I have played with her paws quite often, and now they are so easy to manicure, I believe she looks forward to it. Haha! If only she knew, she could make it difficult. I can honestly say she lowers my blood pressure - it's a twofer, I have her to pet and stroke and she just stretches out all crazy, sometimes into a knot. (How does she do that?) And if I stop she looks at me and meows 'why did you stop' - really! This March I will begin building an outdoor cat house for her and her brothers and sisters. It will be coming from a house window, and when the window is open they can hang outside and come in and out when they feel like it - hopefully no more trying to run out the doors. 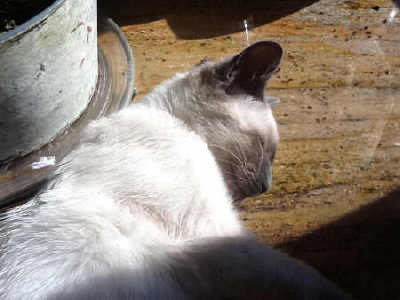 So that is my Dottie, thank you all Siamese cat lovers and all others for taking the time to read my story. 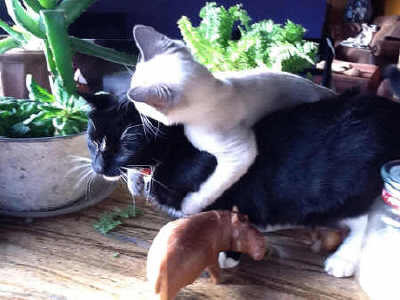 And also to a great web site, Life with Siamese Cats and Meezer Musings! Thanks so much, Clem, for your lovely comments about the site, and particularly for Dottie's story and photos - they're great and I can see that she must have been a wonderful Christmas gift! 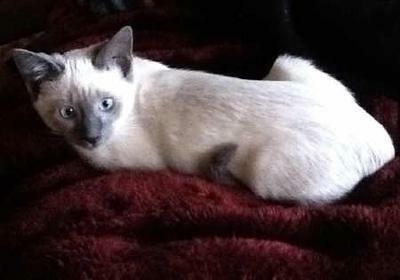 She's a beautiful kitty and I agree that she looks like a lilac point Siamese; too pale, I think, to be a blue point. She certainly seems to be having fun with one of her brothers or sisters! It's great that she's settled in so well with your other cats and dogs, and I hope she has a long and happy life with you all. Siamese cats - more like dogs than other cats? Comments for Dottie - Best Christmas Gift Ever! My Himalayan, Gabby (not hard to imagine why I named her that) plays with her Chihuahua brother, Petey. They chase each other up and down the hallway. Both possessing more energy than anyone has a right to, this works out well for both of them. My other cat, a "normal" solid white, not Siamese, casts looks of "you two are not right in the head" as they carry on with their antics. I love your lilac Siamese! What a beauty. Isn't it fun, and an adventure for sure, to have cats? 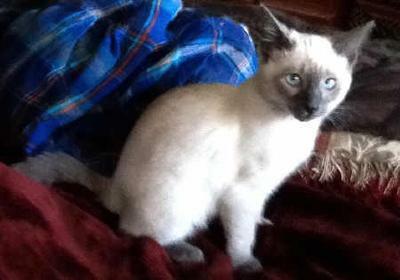 By the way, Gabby is a blue cream tortie point Himmy. Nice to "meet" a fellow Siamese lover. My best to you, your lovely cat, and the rest of your four legged crew. Sounds like you have quite a little pet palace there! And what a little sweetie Dottie is. I'm sure she's grown quite a bit by now, but you are lucky to have pictures of her as a kitten. I had several of my Rascalbear when he was that little, but over the years they have gone missing. Boo. Hope she is still doing well!